On Thursday Air Canada and Aeroplan launched their latest promotion for flying on Air Canada called Earn Your Wings. The promotion not only awards you with bonus Aeroplan Miles for select flights on Air Canada but you will also have the chance to share in a pot of 10,000,000 Aeroplan Miles if you land in the top 25 'Wings' earners. What is Earn Your Wings? Earn Your Wings is a promotion strictly for flying (great for Frequent Flyers!) on Air Canada unlike the recent Star Challenge which was more coalition based by including lots of partners outside of Air Canada and basically you will 'Wings' for flying on Air Canada and also earn 'Badges' for select routes/cities/actions which translate to additional wings earned. What I like about this promo is something that I have promoted from the FFB Group for a long time, an out of the box flight promotion that is not your standard double miles this or triple miles that. Now like many of these promotions with more complex earning options there are some vague rules and terms and conditions that I am sure Air Canada and Aeroplan will either fix or clarify along the way. As with the majority of promotions these days you have to register for it and you can do so here. Aeroplan members must register for this promotion, book their flights and fly between April 11 and June 16, 2013 inclusively in order to be eligible to participate in this promotion and earn wings and badges. The objective of the promotion is to earn and collect wings and badges. Wings and badges can be earned in several different ways. Participants will earn wings for each flight segment of their journey. For example, participants who fly roundtrip from Calgary to Toronto will earn 400 wings. That’s 100 wings for each take off and landing. Select airports have been assigned a higher value of wings. For a list of those select airports and the value of wings assigned, please visit the Badge Legend. Participants must earn wings and/or badges in order to earn Bonus Aeroplan Miles. Any combination of wings and badges that total 2,000 wings will receive 1,000 Bonus Aeroplan Miles. Any combination of wings and badges for a total of 10,000 wings will receive an additional 5,000 Bonus Aeroplan Miles, for a combined total of 10,000 Bonus Aeroplan Miles. Additionally, there will be 10,000,000 Bonus Aeroplan Miles to be distributed equally amongst the participants who place in the top 25 ranking (the “Top 25”) of all participants at the end of the promotion period. All participants will be ranked using the online “Leaderboard” and each participant’s ranking is determined by number of wings earned and accumulated. By registering for this promotion, all participants understand and agree that their user name, destinations travelled and wings and badges accumulated will appear publically on the Leaderboard. The participants who place in the Top 25 at the end of the promotion, will receive their equal share of 10,000,000 Bonus Aeroplan Miles. If there are participants tied in the Top 25, then the 10,000,000 bonus miles will be split among each of the Top 25 participants equally. New bookings made as of April 11, 2013, for travel between April 11, 2013 and June 16, 2013, will be eligible. Any booking made prior to April 11, regardless of travel date, will not be eligible. Now that we got that out of the way lets look out how the earning works. 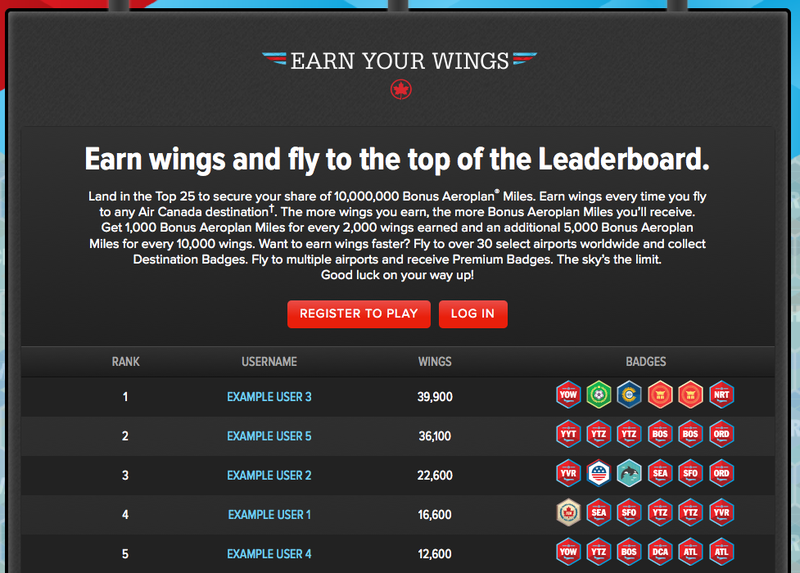 Basically once you earn 2,000 Wings (any combination of badges/wings) you will earn Bonus 1,000 Aeroplan Miles. If you reach 10,000 Wings (once again any combination of badges/wings) you will awarded with an additional 5,000 Bonus Aeroplan Miles. When combined with the 2,000=1,000 means you will get 10,000 Aeroplan Miles for every 10,000 Wings collected with no apparently no limit to the number of wings you can earn. If you fall into the top 25 wings earners you will also share an equal part of 10,000,000 Aeroplan miles. How do you earn Wings? The first and easiest way is simply by flying any Air Canada flight. Per the 'How to Play' above you will earn 100 Wings for every take off and landing. Which means 400 wings for a round trip flight without connections (per example above). Then you can and/or will earn additional wings by collecting badges for traveling to select airports or on select routes. The complete list of badges is below. With just these two flights you would earn 18,300 Wings plus 5,000 bonus Wings at the 10,000 level for 23,300 Wings. As you can see with some creative thinking and planning you can potentially earn a lot of wings/badges which can translate into a decent amount of Aeroplan miles and perhaps a shot at the top 25 leaderboard. Touch down or take off from anywhere Air Canada flies and earn at least 100 wings. Want to earn wings faster? 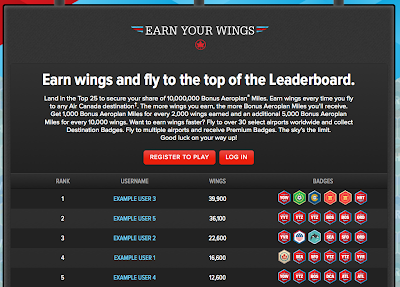 Collect Destination Badges at over 30 airports worldwide and earn between 500 and 2,000 wings. Add this badge to your collection when you take off or touch down at St. John’s International Airport. Add this badge to your collection when you take off or touch down at Halifax Stanfield International Airport. Add this badge to your collection when you take off or touch down at Ottawa Macdonald-Cartier International Airport. Add this badge to your collection when you take off or touch down at Vancouver International Airport. Add this badge to your collection when you take off or touch down at Victoria International Airport. Add this badge to your collection when you take off or touch down at Billy Bishop Toronto City Airport. Add this badge to your collection when you take off or touch down at Newark Liberty International Airport or LaGuardia Airport in New York City. Add this badge to your collection when you take off or touch down at Boston Logan International Airport. Add this badge to your collection when you take off or touch down at Reagan National Airport in Washington. Add this badge to your collection when you take off or touch down at Los Angeles International Airport. Add this badge to your collection when you take off or touch down at George Bush Intercontinental Airport. Add this badge to your collection when you take off or touch down at Denver International Airport. Add this badge to your collection when you take off or touch down at Chicago O’Hare International Airport. Add this badge to your collection when you take off or touch down at San Francisco International Airport. Add this badge to your collection when you take off or touch down at Minneapolis-St.Paul International Airport. Add this badge to your collection when you take off or touch down at Hartsfield-Jackson International Airport in Atlanta. Add this badge to your collection when you take off or touch down at Seattle-Tacoma International Airport. Add this badge to your collection when you take off or touch down at Phoenix Sky Harbor International Airport. Add this badge to your collection when you take off or touch down at Philadelphia International Airport. Add this badge to your collection when you take off or touch down at Port Columbus International Airport in Columbus. Add this badge to your collection when you take off or touch down at Gerald R. Ford International Airport in Grand Rapids. Add this badge to your collection when you take off or touch down at Brussels Airport. Add this badge to your collection when you take off or touch down at Copenhagen Airport. Add this badge to your collection when you take off or touch down at Geneva International Airport. Add this badge to your collection when you take off or touch down at Frankfurt Airport. Add this badge to your collection when you take off or touch down at Heathrow Airport in London. Add this badge to your collection when you take off or touch down at Paris-Charles de Gaulle Airport. Add this badge to your collection when you take off or touch down at Incheon International Airport in Seoul. Add this badge to your collection when you take off or touch down at Narita International Airport in Tokyo. Add this badge to your collection when you take off or touch down at Beijing Capital International Airport. Add this badge to your collection when you take off or touch down at Shanghai Pudong International Airport. Add this badge to your collection when you take off or touch down at Sydney Airport. Add this badge to your collection when you take off or touch down at Guarulhos International Airport in São Paulo. Share your Leaderboard ranking with your friends on Facebook or Twitter to collect this badge. Receive 5,000 wings every time you earn a Premium Badge, which is awarded to participants who take off or touch down at combinations of select airports. Add this badge to your collection when you fly between YVR and SEA, the first route by Air Canada’s predecessor Trans-Canada Airlines in 1937. Add this badge to your collection when you hang out with the paparazzi in at least 3 of the following airports: YTZ, LGA, EWR, LAX, LHR and CDG. Collect this badge when you chow down in 3 of these foodie towns: YTZ, LGA, ORD, LAX, SFO, LHR, NRT, CPH and PVG. Add this badge to your collection when you bask in the sunshine in at least 2 of these sun-filled destinations: LAX, IAH, SFO, ATL, PHX, GRU and SYD. Add this badge to your collection when you take off or touch down in at least 5 of these Canadian airports: YHZ, YOW, YVR, YYJ, YTZ and YYT. Collect this badge when you take off or land in at least 2 of these airports named after U.S. presidents: DCA, IAH and GRR. Collect this badge when you take off or land in at least 2 of these European airports: BRU, CPH, GVA, FRA, LHR and CDG. Satisfy your sweet tooth and collect this badge when you take off or touch down in at least 2 of the following cities known for their chocolate: BRU, GVA, FRA and CDG. Hang out in at least 3 of these cities on the West Coast to earn this badge: YVR, YYJ, LAX, SFO and SEA. Collect this badge when you take off or land in at least 3 of these cities that touch the Eastern seaboard: YHZ, YYT, LGA, EWR, BOS, DCA and ATL. Find yourself in at least 2 of these Midwest airports to earn this badge: ORD, MSP, CMH and GRR. Fly into at least 2 of these airports in the Asia-Pacific region to earn this badge: ICN, NRT, PEK, PVG and SYD. Earn your Stars & Stripes when you take off or touch down in at least 4 of the following U.S. airports: LGA, EWR, BOS, DCA, ATL, LAX, IAH, DEN, ORD, SFO, MSP, SEA, PHX, PHL, CMH and GRR. Be part of the team and collect this badge when you take off or touch down in at least 4 cities whose teams have won the famous hockey champions cup: YVR, YYJ, YTZ, LGA, EWR, BOS, LAX, DEN, ORD, SEA and PHL. Some even pre-date the NHL. Add this badge to your collection when you take off or touch down in at least 2 Commonwealth member capitals: YOW, LHR and SYD. Add this badge to your collection when you take off or touch down in both PEK and PVG. Collect this badge when you take off or touch down in YVR and YYJ, which both saw Olympic action during the 2010 Winter Games. Collect this badge when you take off or touch down in at least 2 of these cities with world-class opera houses: SYD, LHR, CDG and LGA. Collect this badge when you take off or touch down in at least 2 of these cities where the passion for football runs deep: GRU, LHR, CDG, FRA, GVA, BRU, CPH, NRT, ICN and SYD. So what do think of the Earn your Wings promo? How many wings or badges do you forsee earning? Is there anything about this promo you don't like? (I for one am a little peeved that cities in Alberta, Sask, Manitoba and Quebec are not included in any of the badges, the promo is much better for those based in YVR, YYJ, YYZ, YOW!) Feel free to comment below with your thoughts!! I can't register to play for some reason... I enter the four fields (first name, last name, email, Aeroplan number) and it comes back with "Information is missing or invalid. Please verify"
Same here... I get "There was a problem authenticating your information. Please try again"
Just registered, no problem! Thanks Patrick for the heads up on this! -On the afternoon of April 15, a fix was implemented addressing an issue where customers who have a hyphen or an apostrophe in their name could not register (they would of received an error saying their Aeroplan information is invalid). -In order to register, the name that is provided needs to be an exact match to what would appear on someone's Aeroplan card. If it's not an exact match, an 'invalid information' message will appear. -As the promotion needs to authenticate every user against the Aeroplan database, a good internet connection is required. We know of at least one occurence where due to what was likely an intermittent connection, someone's registration failed because the authentication check with the Aeroplan database timed-out. The easiest option is to try again. In order to assist customers who may be experiencing issues, we've also set-up the following email address in order to provide customer support: earnyourwings@aircanada.ca. Should you have any other questions, I would be happy to answer them.